Project Healthy Children (PHC) does not meet all of our criteria to be a GiveWell top charity but is a standout charity. Although we don't recommend these organizations as strongly as we do our top charities, they stand out from the vast majority of organizations we have considered. Most of our investigation of PHC took place in mid-2015, and we last requested updates from PHC about its activities in July 2015. However, we are publishing this page in September 2016. Therefore, much of the content on this page is outdated (i.e., it may not reflect PHC's current plans, the current status of its programs, etc.). Since publishing this review, we have published notes from conversations with PHC in March 2017, October 2017, and June 2018. What are GiveWell’s next steps? PHC has successfully completed the first phase of our investigation process and has been named a standout charity. Depending on PHC’s planned future activities, we will either stop our investigation at this stage, rather than prioritizing its work as a potential top charity, or try to briefly answer our remaining questions and determine whether it is worth moving forward with a full review of PHC with a potential top-charity designation in mind. How does PHC choose countries to work in? Which micronutrients and foods does PHC work with? Does PHC work in areas where micronutrient fortification could have a large impact? Are there micronutrient deficiencies in the areas where PHC works? Do people consume the foods that PHC helps to fortify? How much progress has been made on fortification in countries where PHC works? Is food fortification mandatory and being enforced in countries where PHC works? Is food being fortified to standard? Have deficiencies in the countries where PHC works been reduced? Has PHC successfully exited fortification programs? What fortification programs would have existed in PHC's absence? Has PHC's small-scale fortification initiative effectively fortified foods and reduced micronutrient deficiencies? Does PHC have a track record for the type of monitoring work that it might do in the future? Is there room for more funds? For the remainder of this review, any discussion of PHC's national fortification programs should be understood to refer to the five established programs in Rwanda, Burundi, Malawi, Zimbabwe, and Liberia. PHC told us that so far it has only worked in countries to which it has been invited; PHC believes that for fortification programs to be sustainable after its departure from a country, the government has to be ready to make the programs a priority.11 PHC told us that it has worked with small countries (typically populations of less than 15 million) that either do not have food fortification programs in place but are interested in developing them, or that have programs in place that are faltering in some way. PHC told us that these countries have generally been passed over by larger agencies, which tend to focus on countries with larger populations.12 We have not tried to verify this claim. Before starting work in a country, PHC said that it conducts a high-level assessment, and if warranted, a more in-depth situation assessment to determine whether to work with the country.13 A situation assessment aims to analyze whether deficiencies exist and what foods are good candidates for fortification, and assesses the functionality of government, industry structure, and how the cost of foods could be impacted.14 PHC said it conducts situation assessments by reviewing existing nutritional data and policies and interviewing relevant individuals to learn about the countries' existing work on nutrition.15 PHC does not have the capacity to conduct independent micronutrient deficiency surveys when evaluating countries, so it relies on existing data for its situation assessments.16 To obtain consumption data for its situation assessments, PHC told us that it either uses data from existing sources or conducts rapid on-the-ground surveys.17 We have not reviewed PHC’s country-level situation assessments in detail. PHC told us that it spends roughly &dollar;70,000 per country per year, which decreases to around &dollar;50,000 per year when it is transitioning out of a country.19 For more information about PHC’s spending, see the ‘Spending Breakdown’ section below. In July 2015, PHC was in the process of exploring two options: becoming a stand-alone organization focused on monitoring, or being absorbed by another organization to act as its monitoring arm.45 It planned to solicit feedback on these options from other organizations in the field, and come to a decision later in 2015.46 PHC told us that its small-scale initiative would likely continue as a stand-alone program regardless of the direction of PHC's large-scale fortification work.47 We have not yet followed up with PHC about which activities it expects to focus on in the future. Does micronutrient fortification improve health? Broadly, we believe that micronutrient fortification may be a highly effective intervention, with possible effects on cognition, child mortality, anemia, and other outcomes. We have completed intervention reports on salt iodization and vitamin A supplementation (but have not yet investigated vitamin A fortification). Our research into the other micronutrients that PHC fortifies with (folic acid, iron, zinc, and B vitamins) is ongoing. Does PHC work in areas where micronutrient fortification could have a large impact? Generally, we would guess that PHC works in countries with relatively high levels of micronutrient deficiencies, since it tends to work in countries where the average income per person is very low and major health problems are relatively common. PHC has sent us third party surveys reporting high levels of micronutrient deficiencies and reporting that people commonly consume the types of foods that PHC aims to fortify, but we have not yet vetted these surveys or attempted to review their methodologies. How much progress has been made on fortification in countries where PHC works? How much of that progress should we attribute to PHC? It seems that all of the countries where PHC works have taken steps toward mandating fortification but, as of July 2015, we had not yet seen evidence that food producers in PHC countries were fortifying their products with the appropriate levels of micronutrients. We also have not seen micronutrient deficiency data that was collected recently enough to evaluate the possible effect of fortification programs on health outcomes. So, overall we do not have strong evidence that major progress has been made on fortification in countries where PHC works, though there are some signs of potential progress. Since our investigation of PHC has been relatively limited to this point (more), we are unsure what portion of progress on fortification in PHC countries we should attribute to PHC’s work. We also briefly consider the evidence for the impact of PHC’s small-scale fortification programs and PHC’s track record for monitoring and evaluation activities (since it may shift toward focusing on such activities in the future). In both cases, our information is fairly limited. We would guess that PHC works in countries with relatively high levels of micronutrient deficiency, since it tends to work in countries where the average income per person is very low and major health problems are relatively common. However, we do not have a confident view of the magnitude of any particular micronutrient deficiency in countries where PHC works. PHC Malawi situation assessment 2010, Pg 3. PHC Rwanda overview and context 2009, Pg 3. PHC Liberia fortification guidelines 2014, Pg 15. PHC has sent us quantitative data reporting that foods that PHC helps to fortify are relatively widely consumed, although there seems to be large variance across foods and countries. We have not independently vetted the survey data that PHC has sent us and we have not attempted to understand the underlying methodology of the surveys in detail. We do not see strong reason to doubt that the staple foods that PHC aims to fortify are commonly consumed, though we are unsure what portion of people’s food consumption in PHC countries comes from small-scale producers. Small-scale producers may be less likely to comply with fortification standards due to high costs and technical challenges. Our understanding is that by July 2015, all five countries where PHC had established national fortification programs had created fortification standards that were in various stages of becoming mandatory and enforceable, but that none of these countries had reached the final stage in which legislation is officially signed (see the table below for more detail). In three countries, PHC anticipated that legislation would be passed in the coming months;50 we have not yet followed up with PHC to see if these events have happened as planned. We do not yet have much evidence about whether fortification mandates are being enforced; we discuss what we know about whether foods are being fortified to standard below. We would guess that PHC has played some role in the drafting and passing of this legislation, but we have not yet made a significant effort to understand specifically how much of the progress on passing legislation may be attributable to PHC versus other actors, since we have not seen much evidence about whether fortification mandates are being enforced. The table below shows our understanding of the status (as of July 2015) of legislation in the five countries where PHC was running a national fortification program. All information is based on what PHC has told us; we have not independently verified these claims. Standards published in a government journal? In July 2015, there was not enough monitoring data collected from industry to make an assessment of PHC's progress towards getting industries to implement fortification. PHC has shared with us its estimates of how much fortification is occurring in the countries where it works (see following footnote for details).65 However, we have not seen monitoring data to support these estimates. Our impression is that the results in Liberia’s first quarterly report implied that neither domestic producers nor importers were consistently fortifying to standard, but PHC told us that these results were inconsistent with external testing, and that the report uncovered a problem with the laboratory's centrifuge.68 PHC has since purchased a new centrifuge for the laboratory, and is optimistic that this will solve the testing issues.69 In July 2015, the next quarterly report was expected between July and September.70 We have not followed up with PHC to see if this report was released as planned, and if its results showed fortification up to standard. When does PHC expect more data? We have not seen any data on whether PHC's programs successfully lead to a reduction in levels of micronutrient deficiencies. We have seen evidence that in some cases, micronutrient deficiencies have been reported to be falling over time prior to fortification; for example, in Rwanda, iron deficiency in children reportedly fell from 69% in 2000 to 48% in 2008, and iron deficiency anemia in women reportedly fell from 43% to 27% in the same time period,77 though PHC has told us that no fortification other than the iodization of salt was occurring in Rwanda in these years.78 Because of this, it may be difficult to know how much of a decline in micronutrient deficiencies to attribute to food fortification. Are all identified industries and importers producing and importing the fortified foods at the required standards? Are samples and / or results from all identified border points and all identified staple food producers being obtained on a regular basis? Are noncompliance measurements being followed up on? Are surveillance mechanisms put in place to ensure that 80% of the population is consuming fortified foods? For more information on PHC's qualitative metrics and its documentation of its progress in country programs, see PHC combined metrics July 2015 and PHC combined metrics (version 2) August 2015. We do not have a strong sense of what fortification programs would have existed in the absence of PHC. We provide the below information as context that may be helpful in beginning to consider what fortification programs may have existed in the absence of PHC. The national fortification program that we have the most information about is that in Liberia. PHC told us that Liberia had been passed over by larger organizations because it was import-dependent,85 but that while PHC was in conversations with the Liberian government a large domestic producer was established, creating an opportunity for a fortification program.86 We have not attempted to vet this claim. It seems that international organizations have also supported micronutrient fortification programs in countries nearby Liberia; we have not yet investigated how PHC’s support for fortification programs may differ from the support offered to nearby countries. Since PHC started work in Liberia in 2010,91 USAID has funded Helen Keller International to implement a project to initiate food fortification in West Africa.92 This project involves Liberia and 14 surrounding countries (Benin, Burkina Faso, Cape Verde, Cote D’Ivoire, Gambia, Ghana, Guinea, Guinea Bissau, Mali, Niger, Nigeria, Senegal, Sierra Leone and Togo).93 USAID reports that 12 of these 15 countries now have mandatory legislation for fortifying cooking oil, and that 14 now have mandatory legislation for fortifying wheat flour.94 We have not vetted these reports. Overall, PHC told us that there are many local organizations working on fortification in Liberia, but that there is little international involvement, with the exception of UNICEF.95 PHC believes that without its assistance, it is unlikely that there would be a food fortification program in Liberia.96 We have not yet investigated the case of Liberia deeply enough to reach a view on the likely counterfactual of PHC’s work. As points of comparison, PHC has told us that Namibia, Uganda, and Zambia approached PHC at a time when it did not have the capacity to start new programs. PHC also informally spoke with the Democratic Republic of the Congo (DRC), but did not believe that it had the capacity to work with a country of that size.99 Of these countries, FFI's map shows Uganda as having mandatory fortification in 2014, Zambia as having no fortification, and Namibia and the DRC as having over 50% voluntary fortification.100 We have not vetted the data from this map. The above information suggests that countries sometimes make progress on fortification without PHC’s support (even if they have requested its support). However, our information about fortification in these countries is limited, and we have not vetted the data in FFI progress map 2014. If we were to further analyze the impact of PHC’s work, we may investigate progress on fortification in non-PHC-supported countries in more depth. The bulk of PHC’s work to date has focused on large-scale fortification, so we have generally focused this review on the track record of its large-scale fortification work. However, recently PHC has also begun supporting small-scale fortification. Overall, we have not yet seen enough information to make a confident assessment of whether PHC's small-scale fortification initiative is effectively fortifying flour, and we do not know how many people are likely to be affected by small-scale fortification in the areas where PHC currently works. In July 2015, PHC told us that 56 fortification devices had been installed in mills as part of PHC's small-scale fortification initiative, Sanku.102 Sanku states that one device can fortify flour for up to 100,000 people daily.103 We do not know how many people are typically being reached by an average small-scale mill using one of Sanku’s devices. PHC has told us that it has tested the flour produced at these mills and confirmed that the device is consistently fortifying flour within the required range of error.104 It has sent us documents describing a testing procedure, and results from testing for two mills.105 We have not seen results from tests at other mills. The test results we have seen seem to show that the fortification devices can function effectively if the right procedures are followed, but we do not know if the appropriate procedures are consistently being followed correctly. For example, the test for determining and setting the dose rate is listed before the test for confirming the dose rate;106 if tests are performed in this order, that would seem to indicate that the series of tests provides evidence that the device is functional, but less evidence as to whether flour was being fortified to standard prior to the series of tests. We have not seen regular monitoring of small-scale mills that indicates whether the device is typically being used correctly. Based on the information that we have seen, it is our impression that PHC does not yet have a track record on the monitoring work that it might shift to focus on in the future. Are there negative effects of micronutrient fortification? We are aware of some potential negative effects of micronutrient fortification on health, such as potential increased cancer rates associated with folic acid fortification and potential increased malaria rates associated with iron fortification. We plan to discuss these effects further in our forthcoming reports on folic acid fortification and iron fortification. If successful, it seems plausible that micronutrient fortification programs such as those supported by PHC could be as cost-effective as our other priority programs. Whether foods are being fortified at appropriate levels: As discussed above, we have not yet seen monitoring data about what portion of producers are fortifying foods at appropriate levels. Attributing impact to PHC: If we were to have better information about how many producers were successfully fortifying, we would then want to improve our estimate of how much credit for fortification we ought to attribute to PHC. Some factors that complicate this analysis are that different organizations often collaborate on fortification programs and it is difficult to know what would have happened in the absence of PHC’s assistance. PHC’s future plans: PHC’s future work may be very different from its past work (more), so we would want to better understand its future plans before attempting to estimate the impact of additional funds given to PHC. Note that PHC will receive &dollar;100,000 from GiveWell upon publication of this interim review (as part of our "top charity participation grants," funded by Good Ventures), which could be allocated toward the above funding gaps. What is the current coverage of fortified foods in the countries that PHC works in? So far we have seen very little monitoring data from the programs that PHC works with, and we do not have a strong understanding of how successful they have been in terms of effectively fortifying foods that have reached the populations in need. While national fortification programs have the potential to be highly cost-effective, there could be a large difference between what is legislated by a national fortification program and the reality of what is being effectively fortified. How much of the progress in fortification in countries where PHC works should we attribute to PHC? Since our investigation of PHC has been relatively limited to this point (more), we have not yet attempted to do detailed case studies of PHC’s impact. Such case studies would consist of trying to understand what would have likely happened if PHC had not intervened in particular countries and understanding the monitoring data from particular countries in more depth. To see examples of such case studies, see our reviews of Iodine Global Network and the Global Alliance for Improved Nutrition’s universal salt iodization program. What are the health benefits of micronutrient fortification at the levels at which PHC fortifies? We have researched some, but not all, of the micronutrients with which PHC fortifies. Have micronutrient deficiencies been reduced in the areas where PHC works? What programs will PHC focus on in the future, and how effective will these be? We have little understanding of what PHC's future work will consist of after 2017, or how effective its work is likely to be. Reviewing documents PHC sent us after these conversations, and in response to our queries. "Project Healthy Children (PHC) provides technical assistance to small countries as they design and implement food fortification programs." GiveWell’s non-verbatim summary of a conversation with Laura Rowe on February 19, 2015, Pg 1. "Project Healthy Children (PHC) provides technical assistance to small countries as they design and implement food fortification programs. This work is done in-service of national governments who have agreed to prioritize fortification." GiveWell’s non-verbatim summary of a conversation with Laura Rowe on February 19, 2015, Pg 1. "PHC helps food producers revamp their production lines to accommodate the fortification process, source the required vitamins and minerals to add to the food, and design and implement internal testing and quality control procedures." GiveWell’s non-verbatim summary of a conversation with Laura Rowe on February 19, 2015, Pg 2. "Despite the increasing adoption of large-scale fortification programs throughout the developing world, however, a large portion of individuals living in rural and remote areas do not have access to centrally processed foods and therefore do not benefit from large-scale fortification programs. "PHC sees an opportunity to transition from helping countries design food fortification programs to helping countries improve their ability to monitor their programs." GiveWell’s non-verbatim summary of a conversation with Laura Rowe on February 19, 2015, Pg 8. "If PHC transitions to monitoring work, it will likely be doing only this type of work by the beginning of 2018." GiveWell’s non-verbatim summary of a conversation with Laura Rowe on February 19, 2015, Pg 9. "PHC begins its work in a country by creating a National Fortification Alliance, which typically includes the country’s ministries of health, commerce and / or trade, agriculture, and / or education; bureaus of standards, staple food producers and importers, consumer associations, and academia. PHC then guides this alliance through the process of creating a food fortification implementation plan for the country." GiveWell’s non-verbatim summary of a conversation with Laura Rowe on February 19, 2015, Pg 4. "PHC’s technical assistance focuses on four elements: 1. Policy and legislation 2. Country-specific standards creation and regional harmonization 3. Industry implementation 4. Government monitoring and social advocacy" GiveWell’s non-verbatim summary of a conversation with Laura Rowe on February 19, 2015, Pg 1. PHC told us that it assists the government in drafting food fortification standards: "PHC works with country governments to draft food fortification standards. These standards are based on deficiency levels and food consumption patterns. These standards also have to be close to existing regional standards to minimize any barriers to trade with other countries in the region." GiveWell’s non-verbatim summary of a conversation with Laura Rowe on February 19, 2015, Pg 2. PHC told us that it only mandates standards when the price of a good will not increase by more than 2%: "Sugar, which is not produced domestically in Liberia, was omitted from the mandatory program because importers were unable to comply with standards and keep the price increase under PHC’s two-percent limit." GiveWell's non-verbatim summary of a conversation with Laura Rowe on July 21, 2015, Pg 2. "PHC also works with country governments to write and pass legislation that makes the food fortification programs mandatory. Mandatory programs level the playing field in terms of cost for producers and importers adopting fortification. Mandatory programs allow countries to correctly calculate the amounts of micronutrients that should be added to foods to reduce deficiencies in their populations. These calculations can only be truly effective if countries can assume that all sources of a particular food will contain the designated amount of micronutrients. Mandatory programs are an effective way to ensure nutritional impact." GiveWell’s non-verbatim summary of a conversation with Laura Rowe on February 19, 2015, Pg 1-2. Industry implementation. PHC told us that "PHC helps food producers revamp their production lines to accommodate the fortification process, source the required vitamins and minerals to add to the food, and design and implement internal testing and quality control procedures." GiveWell’s non-verbatim summary of a conversation with Laura Rowe on February 19, 2015, Pg 2. Government monitoring and social advocacy. PHC told us that it helps countries integrate fortification monitoring into their existing food monitoring systems, and ensures that countries have trained inspectors as well as the necessary equipment to collect and aggregate data: "PHC assesses countries' existing food monitoring systems and helps countries integrate fortification monitoring into these systems…After collecting this information, PHC collaborates with regional consultants specializing in how to sample and test fortified foods to train countries' food inspectors. PHC also ensures that countries have equipment in the field and in the lab that allows their inspectors to test foods for micronutrient fortification levels. PHC also ensures that countries have data compilation tools available to collect and aggregate the data generated by their food inspectors. Countries typically do not have their own compilation tools, so PHC creates a unique monitoring workbook for each country that it works with. These workbooks automatically generate graphics based on data entered by inspectors and clearly display where compliance with the country's food fortification standards does and does not exist." GiveWell’s non-verbatim summary of a conversation with Laura Rowe on February 19, 2015, Pg 2. "PHC designed a version of the regional food fortification logo specifically for Liberia, replacing the French copy with English." GiveWell's non-verbatim summary of a conversation with Laura Rowe on July 21, 2015, Pg 6. "The National Consumer Council of Liberia created a proposal for theatrical demonstrations and plays in the marketplace. PHC is coordinating with UNICEF to identify components of the proposal that may be redundant and those that are complementary." GiveWell's non-verbatim summary of a conversation with Laura Rowe on July 21, 2015, Pg 6. Inferred from a private version of PHC combined metrics July 2015, which showed the progress made on each national fortification program and listed Sierra Leone as pending. Note that all of the below information is based on what PHC has told us and PHC's website; we have not independently verified these claims. "Currently, fortification is taking place by the country's [Rwanda’s] largest maize flour producer. Others are awaiting the decree . . . Legislation/Legal Requirements . . . Waiting final signing by the new Food and Medicine Authority. Slated for Aug 2015." PHC Before and After analysis regarding PHC's impact 2015, Pg 1. Currently helping to ensure sufficient monitoring mechanisms are in place using PHC’s Fortification-specific Management Information System with the goal of effectively tracking and improving upon product compliance to national standards"
"Current Status [Malawi] Adopted and gazetted. Most facilities are fortifying their products. Final facilities to come on line once grace period is formally communicated to industry. Slated for Aug 2015." PHC Before and After analysis regarding PHC's impact 2015, Pg 2. Currently working with the National Standards Laboratory and importers to ensure products continue to meet national standards, advocacy campaigns are designed, and monitoring and surveillance systems are in place"
"[In Liberia] Domestic producers fortifying to standard. Importers need further follow-up." PHC Before and After analysis regarding PHC's impact 2015, Pg 3. Working with domestic industry to facilitate fortification scale-up"
"Burundi's largest cooking oil facility already fortifying to standard. Others to come on line after standards gazetting." PHC Before and After analysis regarding PHC's impact 2015, Pg 4. With government, developing a comprehensive database and reporting tool for monitoring using Zimbabwe’s already-existing online health management system"
"[In Zimbabwe] Standards drafted and under review. Slated to be adopted by December 2015...About half of the facilities are currently fortifying." PHC Before and After analysis regarding PHC's impact 2015, Pg 5. A private version of PHC combined metrics July 2015 showed the progress made on each national fortification program, and listed Sierra Leone as pending. "PHC only works in countries in which they are invited. Governments have to be ready to independently run and prioritize food fortification programs for the programs to be successfully implemented over the long term. "Countries typically hear about PHC through word of mouth or from another organization. Burundi heard about PHC from Rwanda, and Sierra Leone heard about PHC from Liberia." GiveWell’s non-verbatim summary of a conversation with Laura Rowe on February 19, 2015, Pg 3. "PHC works with small countries (typically populations of less than 15 million) that either do not have food fortification programs in place but are interested in developing them, or that have programs in place that are faltering in some way. For example, PHC was invited by the Government of Malawi to assist in strengthening their already-existing program. PHC focuses on small countries generally overlooked by larger agencies." GiveWell’s non-verbatim summary of a conversation with Laura Rowe on February 19, 2015, Pg 3. "Once a country approaches PHC for assistance with its food fortification program, PHC conducts a high-level assessment, and if warranted, a more in-depth situation assessment, to determine whether to work with the country." GiveWell’s non-verbatim summary of a conversation with Laura Rowe on February 19, 2015, Pg 3. Analyzing detailed micronutrient deficiency data to understand the types and severity of deficiencies in the population. Analyzing food consumption data, or data that describe the types and quantities of food that people typically eat, to understand which foods might be candidates for fortification. Assessing government functionality and profiling ministry officials involved in fortification and / or nutrition work to better understand how ministries work together. Assessing industry structure to identify the number of producers and importers of staple foods and from where staple foods are typically imported. Conducting a market analysis of how fortification would impact the cost of various foods." GiveWell’s non-verbatim summary of a conversation with Laura Rowe on February 19, 2015, Pg 3. "PHC conducts situation assessments by reviewing existing nutritional data and policies and by interviewing relevant individuals to learn about the work the country has already done in the nutrition and / or food fortification arena and to better understand how fortification might fit (or not fit) into the existing landscape." GiveWell’s non-verbatim summary of a conversation with Laura Rowe on February 19, 2015, Pg 3. "PHC is typically able to rely on existing micronutrient deficiency data for its situational assessments. PHC does not have the human or financial capacity to conduct independent micronutrient deficiency surveys." GiveWell’s non-verbatim summary of a conversation with Laura Rowe on February 19, 2015, Pg 4. "In terms of obtaining consumption data, PHC will conduct rapid on-the-ground surveys, obtain data from already-existing consumption data sources, or conduct implied consumption analyses from existing sources. In a few cases PHC has administered the Fortification Rapid Assessment Tool (FRAT), which is a questionnaire that collects consumption information specifically pertaining to effective fortified food staples. In other cases, PHC makes estimations about consumption based on other data, such as informal market assessments or general household expenditure surveys." GiveWell’s non-verbatim summary of a conversation with Laura Rowe on February 19, 2015, Pg 4. "PHC typically spends between five and eight years working with a country to develop its food fortification program. Two factors—the country’s political stability and the degree to which it takes ownership of its program—usually determine how long PHC remains involved. For example, PHC will likely only spend four years in Liberia because individuals in Liberia’s government have provided strong leadership for its program. Conversely, PHC has been in Rwanda since 2007 because there has been a great deal of turnover in its government, which necessitates PHC’s continued presence." GiveWell’s non-verbatim summary of a conversation with Laura Rowe on February 19, 2015, Pg 4. "PHC spends roughly &dollar;70,000 per country per year." GiveWell’s non-verbatim summary of a conversation with Laura Rowe on February 19, 2015, Pg 4. "PHC’s per-year cost for a country decreases to approximately &dollar;50,000 when it is transitioning out of the country." GiveWell’s non-verbatim summary of a conversation with Laura Rowe on February 19, 2015, Pg 5. "In each country of operation, PHC places or co-places one, single Country Coordinator whose role it is to act as a catalyst and provide guidance to government and industry in support of a national program…One country coordinator will split his or her time between two countries as PHC transitions out of one and into another." GiveWell’s non-verbatim summary of a conversation with Laura Rowe on February 19, 2015, Pg 7-8. "Country Coordinators function as technical consultants to governments throughout the design and implement phases of food fortification programs." GiveWell’s non-verbatim summary of a conversation with Laura Rowe on February 19, 2015, Pg 7. "Country coordinators are often physically co-located with countries' ministries of health so that they are perceived as part of the government." GiveWell’s non-verbatim summary of a conversation with Laura Rowe on February 19, 2015, Pg 7. "One country coordinator operates in each of the following countries or country clusters: Tanzania, Liberia, Rwanda/ Burundi, and Malawi/ Zimbabwe." GiveWell’s non-verbatim summary of a conversation with Laura Rowe on February 19, 2015, Pg 7. "The international community has been skeptical of small-scale efforts because of difficulties monitoring and the propensity for human error." GiveWell's non-verbatim summary of a conversation with Laura Rowe on July 21, 2015, Pg 11. "PHC’s programs use a device that fits small-scale mills, dispensing vitamin mineral premix according to established standards and at a rate based on the decreasing weight of the grain in the hopper as it passes into the grinder. Software that comes with the device calculates the loss of weight and is preprogrammed with national standards." GiveWell's non-verbatim summary of a conversation with Laura Rowe on July 21, 2015, Pg 11. "Fifty-six of these devices have been installed in three regions in Tanzania through a pilot program, part of a rural agriculture initiative funded by USAID." GiveWell's non-verbatim summary of a conversation with Laura Rowe on July 21, 2015, Pg 11. "Each project and program we aim to partner with is unique. Depending on the business model chosen, the Sanku Dosifier can range from US&dollar;0 - &dollar;4,000. Other dosifiers on the market cost US&dollar;7,000 - US&dollar;10,000." "A single dosifier has the potential to fortify flour for 100,000 people daily"
PHC Sanku cutsheet 2015, Pg 1. Consulting fees for industry assessments and inspector training. Travel costs for PHC staff. Taxes paid to the countries. Gap funding for national fortification alliances and national standards labs. "Gap funding is used to ensure that national fortification alliance meetings are held during the early stages of countries’ fortification programs. The funding covers small items like transportation, room rental, and refreshments, but without these things, the meetings would likely not happen. Country governments or other organizations eventually absorb the costs of these meetings." GiveWell’s non-verbatim summary of a conversation with Laura Rowe on February 19, 2015, Pgs 4-5. All data in this section are from PHC 990 form 2010 (Pg. 10), PHC 990 form 2011 (Pg. 10), PHC 990 form 2012 (Pg. 10), PHC finances 2013-14, and PHC budget 2015 (unpublished). Includes salaries and wages (including overseas payroll), employee benefits, and payroll taxes. For 2010-2012, this includes office expenses; depreciation, depletion, and amortization; insurance; communications (2010 only); "other miscellaneous;" and "all other expenses." For 2013, this includes communications; office supplies; "other" (not including small-scale fortification materials); property and equipment; insurance; and utilities. See 'All country summary' sheet in PHC costing board book with country projections 2014. See 'Cost' column and 'Actual' column in sheets 'Burundi', 'Malawi', 'Rwanda', and 'Liberia' in PHC costing board book with country projections 2014. All from 'All Country Summary' sheet in PHC costing board book with country projections 2014. Iron, zinc, folic acid, and vitamins A, B1, B2, B3, B6, and B12 are added to flour. Vitamin A is added to cooking oil and sugar. Iodine is added to salt." GiveWell’s non-verbatim summary of a conversation with Laura Rowe on February 19, 2015, Pg 5. "Not every country adds vitamin A to flour because doing so is expensive. Adding it to cooking oil and sugar is more cost-effective. However, many countries push to add vitamin A to flour because regional standards require that it be added." GiveWell’s non-verbatim summary of a conversation with Laura Rowe on February 19, 2015, Pg 5. Sugar with vitamin A, in line with regional standards"
PHC Before and After analysis regarding PHC's impact 2015, Pgs 1, 2, 3, 4, and 5. "PHC sees an opportunity to transition from helping countries design food fortification programs to helping countries improve their ability to monitor their programs. Few countries remain that need PHC's assistance developing food fortification programs, but many countries need PHC's assistance to improve their existing programs' monitoring systems. These systems are often overlooked when developing fortification programs, or they are planned but not given sufficient resources to operate." GiveWell’s non-verbatim summary of a conversation with Laura Rowe on February 19, 2015, Pg 8. "[W]ithout effective monitoring, mandatory food fortification programs typically do not meaningfully reduce micronutrient deficiencies and can lead countries to think that food fortification does not work." GiveWell’s non-verbatim summary of a conversation with Laura Rowe on February 19, 2015, Pg 8. Become a standalone organization focused on monitoring – One option is for PHC to remain a standalone organization but focus exclusively on monitoring. Join another organization – The alternative is for PHC to be absorbed by another organization as a monitoring arm. In either scenario, PHC would maintain its current internal structure (providing consulting services to governments with a country coordinator working locally) but shift its focus from program design to monitoring." GiveWell's non-verbatim summary of a conversation with Laura Rowe on July 21, 2015, Pg 10. "PHC plans to solicit feedback on these options from other organizations in the field, and GAIN's global summit should offer an opportunity to do this. PHC hopes to make a decision in the next three to four months." GiveWell's non-verbatim summary of a conversation with Laura Rowe on July 21, 2015, Pg 10. From the section on PHC's small-scale pilot program in Tanzania: "PHC is committed to continuing this effort regardless of how the organization may change in 2016/2017." GiveWell's non-verbatim summary of a conversation with Laura Rowe on July 21, 2015, Pg 11. Some evidence suggests that micronutrient deficiencies may be falling over time, so past surveys could over-represent current deficiencies in the population. For example, in Rwanda, iron deficiency in children fell from 69% in 2000 to 48% in 2008, and iron deficiency anemia in women fell from 43% to 27% in the same time period. "The incidence of iron deficiency in children remains high although it decreased from 69% in 2000 to 48% in 2008"
"Iron deficient anemia, which contributes to maternal mortality, is a significant issue although it fell from, 43% of women in 2000 to 27% in 2008." Both quotes are from PHC Rwanda overview and context 2009, Pg 3, with both statistics from 2008 referencing '2007-2008 mini-DHS' in a footnote. "Burundi’s standards have been adopted and gazetted and are therefore enforceable for domestic producers, but a legislative decree must be signed before the standards can be enforced for importers." GiveWell's non-verbatim summary of a conversation with Laura Rowe on July 21, 2015, Pg 7. "As in Burundi, Rwanda’s standards are enforceable for domestic producers, but not importers. A legislative decree has been drafted in Rwanda, but the issue has become politicized, and the decree has not been signed. "PHC’s work in Rwanda will end in December 2015." GiveWell's non-verbatim summary of a conversation with Laura Rowe on July 21, 2015, Pg 8. "In Zimbabwe (as in Malawi and Liberia), adopting, gazetting, and formally announcing the standards makes them mandatory." GiveWell's non-verbatim summary of a conversation with Laura Rowe on July 21, 2015, Pg 8. "Standards adopted and gazetted." PHC Before and After analysis regarding PHC's impact 2015, Pg 1. "Legislation/Legal Requirements. . . Waiting final signing by the new Food and Medicine Authority. Slated for Aug 2015." PHC Before and After analysis regarding PHC's impact 2015, Pg 1. "Adopted and gazetted." PHC Before and After analysis regarding PHC's impact 2015, Pg 2. "Legislation/Legal Requirements. . . Slated to be passed Dec 2015." PHC Before and After analysis regarding PHC's impact 2015, Pg 2. "Standards drafted and gazetted." PHC Before and After analysis regarding PHC's impact 2015, Pg 3. "Legislation/Legal Requirements. . . Pending two Ministry signatures. Slated for completed by Sept 2015." PHC Before and After analysis regarding PHC's impact 2015, Pg 3. "Standards adopted and gazetted." PHC Before and After analysis regarding PHC's impact 2015, Pg 4. "Legislation/Legal Requirements. . . Pending due to political situation. Only a signature is required." PHC Before and After analysis regarding PHC's impact 2015, Pg 4. "Standards drafted and under review. Slated to be adopted by December 2015." PHC Before and After analysis regarding PHC's impact 2015, Pg 5. "Legislation/Legal Requirements. . . Pending standards review." PHC Before and After analysis regarding PHC's impact 2015, Pg 5. 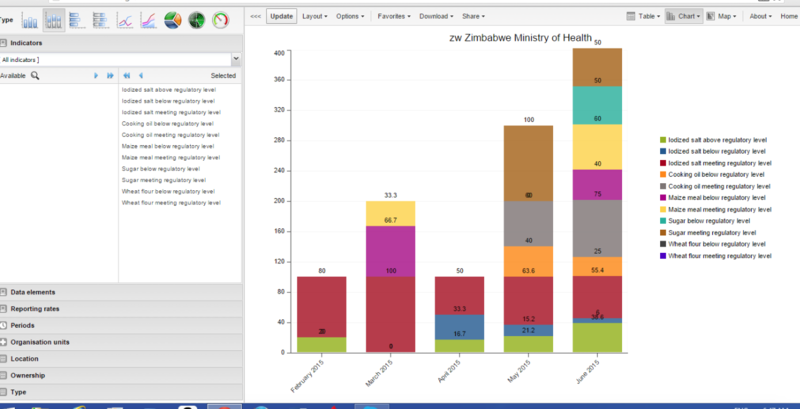 See the column 'Status' in the section 'Preparing for data collection' for Liberia, Rwanda, Burundi, Malawi, and Zimbabwe in the 'Summary' sheet of PHC combined metrics July 2015. "The next quarterly report is expected between July and September, and PHC is hopeful that most samples will be up to standard." GiveWell's non-verbatim summary of a conversation with Laura Rowe on July 21, 2015, Pg 5. PHC combined metrics July 2015, sheet 'Summary,' cells F63 to F65. PHC combined metrics July 2015, sheet 'Summary,' cells F97 to F99. PHC combined metrics July 2015, sheet 'Summary,' cells F165 to F167. "Micronutrient deficiency surveys, which measure the prevalence and extent of micronutrient deficiencies, are generally administered 10-12 months after the fortified foods are available on the market. This lag time gives countries sufficient opportunity to work out any issues in their supply chains. These surveys also should not be administered until countries have ensured that at least 80% of its population is consuming the fortified foods. "PHC will provide desk-side support to countries as they administer their micronutrient deficiency surveys. Ideally, countries would include these indicators in existing demographic and health surveys. For countries that are not able to administer their own surveys, PHC assists in establishing partnerships with other agencies that find fund such studies. "Malawi has scheduled a micronutrient deficiency survey to be conducted in 2015 / 2016. PHC is encouraged by the progress in Malawi and believes this survey will provide important data to capture the fortification program's impact." GiveWell’s non-verbatim summary of a conversation with Laura Rowe on February 19, 2015, Pgs. 6-7. "Prior situation. . .Salt with iodine at 100ppm (too high based on current WHO potassium iodate recommendations) with coverage of ~98%." PHC Before and After analysis regarding PHC's impact 2015, Pg 1. "As the program matures and as government and industry take on greater responsibilities, work streams can be slowly and seamlessly handed over to government and PHC assistance withdrawn without a void being felt." GiveWell’s non-verbatim summary of a conversation with Laura Rowe on February 19, 2015, Pg 7. "When PHC began full-scale operations in 2010, they asked their donors for a commitment to ensure PHC operated for seven years, reached seventy million people, in seven countries." GiveWell’s non-verbatim summary of a conversation with Laura Rowe on February 19, 2015, Pg 9. GiveWell’s non-verbatim summary of a conversation with Laura Rowe on February 19, 2015, Pg 6. Does the country have a sampling plan in place for the food products to be fortified? Does the country routinely collect fortification data from food inspectors? Has the country’s food industry appropriately scaled up to accommodate new food fortification procedures? “PHC reviews these benchmark questions for each of its countries on a quarterly basis to determine how to help each country move its fortification program forward.” GiveWell’s non-verbatim summary of a conversation with Laura Rowe on February 19, 2015, Pg 6. See A2 to K7 in 'Summary' sheet of PHC combined metrics July 2015. Note that the first metric listed above ('Are all identified industries and importers producing and importing the fortified foods at the required standards?') has been separated into two metrics in the spreadsheet, now in rows 3 and 4. "Liberia was passed over by large organizations working in food fortification, including UNICEF, the Global Alliance for Improved Nutrition, and USAID because implementing a fortification program can be difficult in a small country that lacks a consolidated domestic producer and is therefore reliant on imports for most staples." GiveWell's non-verbatim summary of a conversation with Laura Rowe on July 21, 2015, Pg 1. 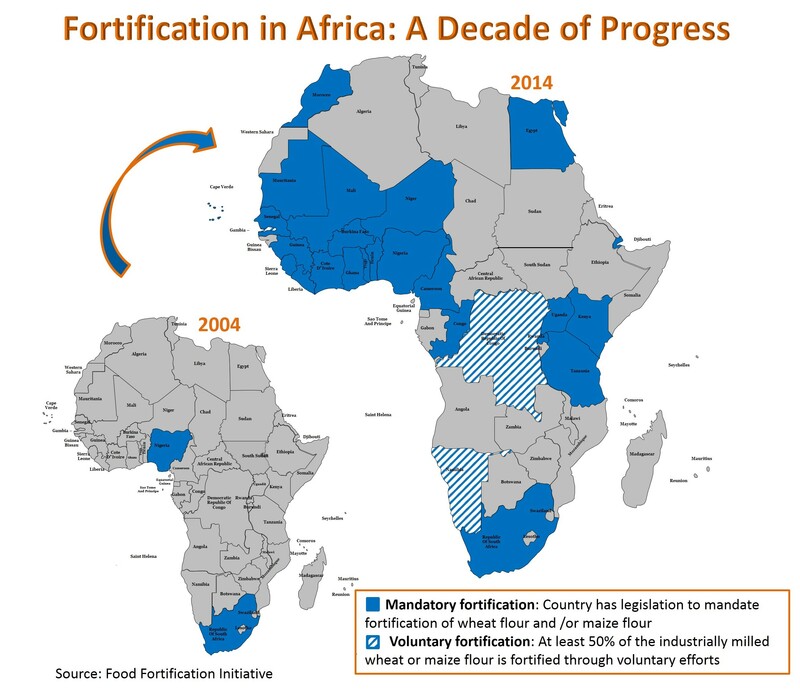 "But in 2010, just as PHC began its conversations with the Liberian government, the emergence of a new domestic wheat flour producer provided an opportunity for the development of a food fortification program in Liberia. PHC began work on a program in 2010." GiveWell's non-verbatim summary of a conversation with Laura Rowe on July 21, 2015, Pg 1. "UNICEF has a mandate to ensure that salt is iodized to standard in Liberia, but it lacks the resources to implement that mandate." GiveWell's non-verbatim summary of a conversation with Laura Rowe on July 21, 2015, Pg 7. "Fortification standards are not yet mandatory, but Premier is already fortifying its product. The Global Alliance for Improved Nutrition (GAIN) donated a dosifier (a device that dispenses precise doses of micronutrient premix), as well as testing equipment that has allowed them to fortify their flour to standard. The first bag of premix was also donated with the understanding that Premier would be responsible for procuring additional premix. "As of June, Premier Milling had purchased an additional bag of premix, and external testing by GAIN and by the premix manufacturer confirmed that its product meets the standard." GiveWell's non-verbatim summary of a conversation with Laura Rowe on July 21, 2015, Pg 3. "There are many local organizations involved with fortification in Liberia (including the National Consumer Council for Liberia) but with the exception of UNICEF, there is very little international involvement. Helen Keller International provided some initial assistance but has drastically reduced its role." GiveWell's non-verbatim summary of a conversation with Laura Rowe on July 21, 2015, Pg 7. "Implementing partner: Helen Keller International"
"Life of Project: January 2011 – September 2016"
“Without PHC’s assistance, it is unlikely there would be a food fortification program in Liberia.” GiveWell's non-verbatim summary of a conversation with Laura Rowe on July 21, 2015, Pg 1. "PHC tested flour produced at these mills and confirmed that the product is consistently within the required range of error." GiveWell's non-verbatim summary of a conversation with Laura Rowe on July 21, 2015, Pg 11. See sheet 'test 3' in PHC Sanku test results 2015. "Have all samples been taken? Have all samples arrived at the appropriate lab on time? Have all qualitative tests been complete? Have all quantitative tests been complete? Are reports generated on a quarterly basis for all imports? Are reports generated on a quarterly basis for all industry? Are reports generated on a quarterly basis for all markets?" For each country, each benchmark has 'No' listed under status. "PHC has never declined to work with a country because its people did not have sufficient micronutrient deficiencies, but it has deferred work in several countries because it was unable to support additional projects beyond its current portfolio. Other larger agencies have recently started food fortification projects in some of these countries, so if PHC does eventually work with these countries, it may be in a more focused capacity. For example, some countries have shown interest in PHC providing specific fortification monitoring support." GiveWell’s non-verbatim summary of a conversation with Laura Rowe on February 19, 2015, Pg. 4. "Taking into account the current fortification landscape, PHC is currently exploring two options, both of which have been vetted with its board. . .PHC plans to solicit feedback on these options from other organizations in the field, and GAIN’s global summit should offer an opportunity to do this. PHC hopes to make a decision in the next three to four months." GiveWell's non-verbatim summary of a conversation with Laura Rowe on July 21, 2015, Pg 10. "Sugar, which is not produced domestically in Liberia, was omitted from the mandatory program because importers were unable to comply with standards and keep the price increase under PHC’s two-percent limit." GiveWell's non-verbatim summary of a conversation with Laura Rowe on July 21, 2015, Pg 2. "After its current funding is exhausted, PHC will likely change its model, which has focused on the implementation of fortification in small countries. Most small countries are now covered under existing mandatory fortification programs. However, while coverage is now widespread (GAIN programs cover most of Central Asia, the majority of Africa is covered, and South American programs are generally further along than those in Central Asia and Africa), monitoring those programs will be very important." GiveWell's non-verbatim summary of a conversation with Laura Rowe on July 21, 2015, Pg 10. Become a standalone organization focused on monitoring - One option is for PHC to remain a standalone organization but focus exclusively on monitoring. Join another organization - The alternative is for PHC to be absorbed by another organization as a monitoring arm." "In either scenario, PHC would maintain its current internal structure (providing consulting services to governments with a country coordinator working locally) but shift its focus from program design to monitoring." GiveWell's non-verbatim summary of a conversation with Laura Rowe on July 21, 2015, Pg 10. "PHC plans to solicit feedback on these options from other organizations in the field, and GAIN’s global summit should offer an opportunity to do this. PHC hopes to make a decision in the next three to four months." GiveWell's non-verbatim summary of a conversation with Laura Rowe on July 21, 2015, Pg 10. Since PHC has &dollar;315,000 in commitments toward its &dollar;515,000 funding need for national fortification programs, we wrote that the remaining gap is &dollar;200,000. “PHC’s current funding ends in late 2016/early 2017. PHC is confident it will be close to implementation in Burundi, Liberia, Malawi, Rwanda, and Zimbabwe by that time." GiveWell's non-verbatim summary of a conversation with Laura Rowe on July 21, 2015, Pg 10. "The type of work that PHC will be able to do in 2017 and beyond will depend on the amount of funding it is able to secure and the actual per-country cost of PHC’s monitoring work, which Ms. Rowe thinks might be less than the per-country cost of PHC’s current projects. If it is able to raise half of its current operating budget, it will likely be able to start its monitoring work in three countries, but likely not at full capacity. If it is able to raise all of its current operating budget, it will likely be able to start monitoring work in five or six countries. If it is able to raise one million dollars or more, it will be able to expand its monitoring work into even more countries." GiveWell’s non-verbatim summary of a conversation with Laura Rowe on February 19, 2015, Pg 9. "PHC’s current funding ends in late 2016/early 2017. PHC is confident it will be close to implementation in Burundi, Liberia, Malawi, Rwanda, and Zimbabwe by that time." GiveWell's non-verbatim summary of a conversation with Laura Rowe on July 21, 2015, Pg 10. "If PHC were to change its mission and become specifically focused on fortification monitoring, additional sources of funding would need to be identified." GiveWell’s non-verbatim summary of a conversation with Laura Rowe on February 19, 2015, Pg 9.